I appreciate Marci Ien. I appreciate what she has done for women of colour in media, I appreciate what she represents, and lastly, I appreciate that she’s really nice. Seriously, she may be the most gracious person I’ve ever met! Just in case you’re unaware of the fabulousness that is Marci Ien, let me school you. As I’m currently not tied down to a 9-5 (#thatfreelancelife), I’m able to catch Ms. Ien on The Social every afternoon. With each episode, I feel like I’ve really gotten to know and respect her even more. Each day I look forward to hearing her opinion on the show’s topic. No disrespect to the other co-hosts, but I tend to agree with EVERYTHING Marci says. I think it’s the way that she presents the facts and gives logical reasons to back up her opinion. Since she’s become a “friend in my head,” I thought, why not, send her a message and see if she’d be interested in chatting with me for Words With Michelle. I was thrilled when I read her reply, “Sure!” but had to hide my excitement from my family and friends. I didn’t want anything or anyone to jinx this opportunity! We had 30 minutes to speak before Marci had to head off for a meeting. I tried to be super quiet, not talk too much or interrupt her. I just wanted to take in every word that she had to say. I know you wanna know more about Marci’s career and projects, so keep reading. Fave Marci quote: My job now is to make sure that there are a lot of people coming next. That means, I gotta do this job well. Awards: In 2016, she was honoured with an African Canadian Achievement Award for her journalistic accomplishments. What was your first job in media? When I was 10 years old, I was on a show called Circle Square. I fell into it and spent most of my childhood doing it. Did you always want to be in media? I thought I’d probably act – I didn’t know I’d be doing news. It changed for me in high school…my university choice and the program I was in. I went towards news. I loved writing. I went to Ryerson for Radio and Television and I ended up getting a job in Hamilton as a news writer on the weekends. One of my friends, who was at school with me, got a job as a writer and told me that they were looking for another one. I thought I’d try. So I went, wrote some copy and I got the job. I commuted from Scarborough to Hamilton every weekend writing the news for the 6 and 11 o’clock anchor. Sometimes I got to report on stories as well. That started everything. I was at Channel 11 for six years – I started as a writer and reporter while I was in my last year of university, then from there I went to CTV in 1997. When I started reporting, I wouldn’t do standups. I would do the stories but you wouldn’t see me in them. I was voicing the pieces. My first news director pulled me aside and said, “People need to connect with you. You need to put yourself in these stories.” I was arguing that it wasn’t about me, it was about the people. Why do they need to see me? He said you need to start doing them. I learned that those are the things, the elements of a good story…it’s the power of connection. What was it like being a woman of colour on Canadian news? In many ways it was trailblazing. There were wonderful women before me – Ona Fletcher was doing the 6 o’clock news on CBC, but there wasn’t anyone on CTV when I got there. There were some men – Scott Laurie is still there, and Steve Chow. Andria Case was there doing CFTO news. When I was appointed news anchor of Canada AM, that made history because there had never been a person of colour doing that job. When I became a co-host with Beverly Thomson, we became the first female team in the country. There was a lot of history made, but I never took it for granted. Is there more diversity in media now? YES! But the point is, it’s not just that we’re reading the news or writing the news – it’s… is there a real seat at the table? Do the people have the power to influence change, and that’s the question. Is your voice heard in a way that you can implement change? Are your story suggestions heard and implemented? I’m interested in that. How did the opportunity for The Social come around? 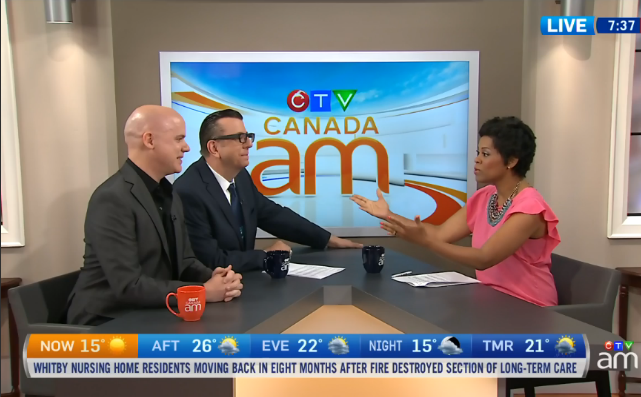 Canada AM ended and I came in as a guest host for Traci Melchor. Update: On the March 29, 2017 episode, Traci Melchor announced that she would no longer be a co-host on The Social, and Marci was officially welcomed as a permanent co-host. What do you like the most about being on The Social? That it’s more of me. I loved my news job, but you aren’t able, and shouldn’t insert your opinion when it comes to the news. It’s a different format. The Social is a platform where we’re talking about life stories. It’s actually a very vulnerable position because we’re talking about personal stories to make our points clear. We’re putting ourselves out there. We’re talking about family, friends, and situations – things you would really just talk to your close friends and family about. After speaking to Marci about her illustrious ground breaking career in media, I asked if she were involved in any projects outside of work. This is where she spoke from the heart about the joy of giving back. She spoke about being involved with the students from Dene high school in La Loche, Saskatchewan where a horrific school shooting took place. Having reported on the story from Toronto, Marci was affected by the tragedy. So much so that she was compelled to reach out to the school. She along with Masai Ujiri (GM of the Raptors) visited the students and school administration. Months after the initial visit, Marci and Masai were able to eventually bring some of the students to Toronto so that they could escape the constant reminder of the school tragedy. The students watched a taping of The Social, went to a Raptor’s game, visited Ryerson University, and were able to sit down and speak with Prime Minister Justin Trudeau. I’m at a place in my life where I want to do different things. I want to use my voice in ways I couldn’t before. Wow, still in awe of this remarkable woman. One of the takeaways from my talk with Marci Ien is that you can be nice and also be respected. While she has accomplished outstanding achievements, she remains humble, polite, kind and incredibly thoughtful. Thanks for everything, Marci! Previous Post MeBookz: Storytelling With A Twist! A pleasure Michelle. Keep up the great work.